I just spent 30 minutes getting a head of cauliflower ready to roast and I’m nowhere near done. I still have to make homemade harissa and an orange and onion salad before the recipe is ready for the table. Jeez. I’m not against spending a few hours in the kitchen, but for a side dish?? Recipes within recipes (first make harissa, page 60….) is one of the problems with “Mad Delicious, The Science of Making Healthy Food Taste Amazing!” by Keith Schroeder. The book won a James Beard Award last year. I checked it out of the library in my cookbook preview project. I’m trying recipe from library books to see which are worth buying. The premise of “Mad Delicious” hooked me, and I like the way the recipes are written. Beside each ingredient is an explanation for why it’s included. Most of the science is pretty basic – citrus juice tightens chicken skin, sugar promotes caramelization, stock is richer than water – but Schroeder surprised me more than once with a technique. For example, in a penne pasta recipe he toasts the dry pasta in a skillet and cooks it risotto-style to produce a creamy sauce without the cream. The proof is in the tasting, though, and I’m still mulling over whether the two recipes I tried are good enough to buy the book. 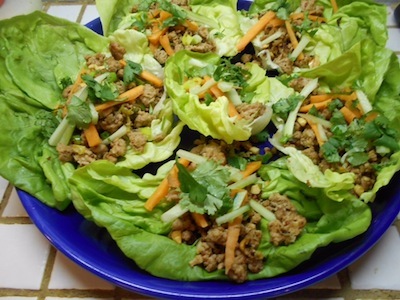 Ground turkey in lettuce wraps was a fun dinner made yummier by my last-minute addition of hoisin sauce. I’ve made this dish before and I like my recipe better. Then again, this was a healthful version made with ground turkey rather than pork. I’ll give it a B plus with my addition of hoisin. Ok, the roast cauliflower with a raisin paste and Moroccan spices is now done. I am underwhelmed. I guess I won’t buy the book. I might make the lettuce wraps again, though, and I’m looking forward to trying that new pasta technique. Combine sriracha and oil in a 12-inch skillet over medium-high heat. Cook 3 minutes or until mixture begins to bubble. Add the onion and ginger. Stir for a minute. Add the turkey, raise heat to high and cook 6 minutes, stirring until meat is scattered throughout the pan. As long as nothing is burning, keep the heat cranked and the turkey moving. When the turkey is cooked through and slightly crisped, turn off the heat. Toss in the green onions, lime juice, peanuts, fish sauce and Thai chilies. Fold to combine. Divide the turkey mixture evenly among the lettuce leaves. Top each with 2 tablespoons cucumber, 2 tablespoons carrot and 1 tablespoon cilantro (and a squiggle of hoisin sauce, if desired). Serve with fresh lime wedges. Makes 8 wraps, two per serving. Thaw one sheet of puff pastry according to package directions. On a lightly floured surface, roll it with a rolling pin until large enough to fit inside a 10-inch springform pan, with 1/2-inch excess all around. Fit into bottom of pan, pressing the excess up the sides. Trim off the corners and use them to patch any torn areas. Preheat oven to 375 degrees. Peel three firm pears, cut in fourths lengthwise and trim away the cores. Cut each fourth in half lengthwise, yielding 8 pieces per pear. Arrange in a pinwheel fashion (one end pointing toward the center, one toward the rim) around the outer edge of the pastry. The pear pieces should almost touch. Arrange another circle of pear pieces inside the first, and so on until the pastry is covered. You may have to peel more pears. Dot top of tart with about one-half tablespoon butter cut into bits. Dust lightly but evenly with powdered sugar. Use more sugar if fruit is tart; less if it is sweet. Bake at 375 degrees for about 50 minutes, until the fruit is soft and the pastry begins to brown. Cool slightly, then remove the sides of the pan. The winner of the Ken Stewart’s meatloaf face-off was bartender Carol Giacobone. I misspelled her last name in my Oct. 21 newsletter. Sorry, Carol. I purchased vanilla beans in bulk online. They’ve been in my fridge for months and have since shriveled and have a light white coating on the ends. Are they still good? Can I still make homemade vanilla if they’re too shriveled to cut and scrape out the seeds? What proof vodka is used? Dear Mary, The coating is probably crystallized vanillin, not mold. Check out this photo of the phenomenon: http://www.amadeusvanillabeans.com/pictures/vanillin.php. Then give them the sniff test. If they smell moldy, toss them. If not, bring them to room temperature and rehydrate the beans in vodka – any proof. No need to scrape out the seeds; use the entire pod. If desired, cut the pods into pieces to increase the surface area exposed to the alcohol. Regarding your search for the best meatloaf, I suggest you Google “bobotie” recipes. Bobotie is a South African meatloaf I first made more than 30 years ago. I don’t have much use for following recipes once I try making one, so I improvise. This style of meatloaf, with spices I love along with almonds, raisins, and chutney, is my absolute favorite. In fact, I don’t think I’ve made any other style meatloaf since I discovered this recipe. I’ve substituted other dried fruits, marmalade or fruity salsa instead of chutney; oats or breadcrumbs instead of bread; used beef/lamb/pork/ground turkey or combinations thereof, and it is always great. So it’s Indonesian filtered through Dutch settlers in South Africa. Or maybe Dutch as filtered through Indonesia and South Africa, as other sites claim. The recipes are as varied as its history. Everyone agrees the dish is made with ground meat topped with an egg custard mixture and baked. Curry powder is almost universal. So is a binder of fresh bread, often soaked in milk. Quite a few recipes call for apricot jam instead of chutney. Almonds usually are added along with dried fruit such as raisins and apricots. Spices, in addition to curry, can include ginger, cinnamon, turmeric, cumin, nutmeg and allspice – or none at all. Of the recipes I found, the one that sounds the most like your version is at the Daring Gourmet, http://www.daringgourmet.com/2013/08/09/bobotie-south-african-meatloaf-casserole/. Can’t wait to try it. Many thanks to Debbie and Peggy for their recommendations on where to purchase unpasteurized apple cider. As soon as I read them I went to the closest, Fruitland’s Farm Market in Deerfield, Peggy’s recommendation, and bought several jugs. It was exactly what I’ve been looking for for years, a great sweet cider with lots of flavor. As soon as it’s gone I’ll go to Walnut Creek, Debbie’s recommendation, buy more, and compare the two. Thanks again to you both. My favorite cider is from River Styx Cider Mill at 8058 River Styx Rd., Wadsworth. They sell it out of a converted garage and make it out back in their little cider mill. Cash only and they say you can freeze it. It has a tart natural flavor and is not pasteurized. From Beth B.: I grew up in Deerfield Township, and my mother still lives there. When visiting her last week, I stopped by the farm stand you mentioned, on Deerfield Circle. It has been advertising the unpasteurized cider on a sign for a couple of weeks. (I know that farm stand better in its previous incarnation as Larry’s Sohio.) The cider is from the nearby The Fruitlands of Carrington’s Farm, 3453 Wayland Road in Diamond, 330-654-2059. It is utterly delicious. My husband says it’s the best cider he’s ever tasted. There’s a family restaurant also on Deerfield Circle that is renowned for its gigantic pancake. I had it a couple of years go, and it was good and practically as big as a tire. I regret that I can’t think of anything else to recommend a trip to Deerfield, especially now that Berlin Reservoir has been lowered for the winter. Dear Beth: Isn’t delicious cider and a pancake as big as a tire enough? Tony and I have eaten at the Circle Restaurant a couple of times and really like its down-home cooking. We have also stopped at the antique store/barn/warehouse between the farm stand and the restaurant. So that’s three reasons to visit Deerfield, which I’ve driven through thousands of times to and from my hometown of East Liverpool and first Kent State University, and then Akron.